This decadent dessert by Christine Moore, renowned pastry chef and owner of Little Flower Candy Co. in Pasadena, CA, will make a stunning centerpiece to any get together. 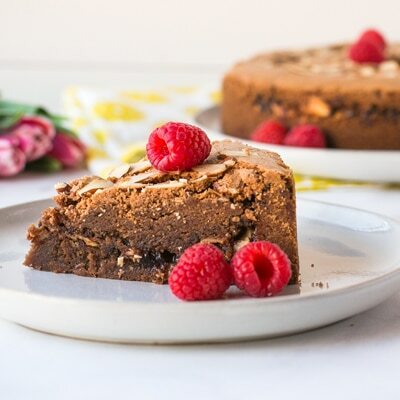 With a layer of rasberry jam, chocolate mini morsels and almonds sandwiched between rich chocolate cake and the subtle crunch of almond topping, this perfect combination is sure to go fast! PREHEAT oven to 300° F. Grease 9-inch springform pan. Line bottom of pan with wax paper. Grease wax paper. SIFT together flour, cocoa and salt into medium bowl. Combine sugar and butter in large mixer bowl on low until blended. Add eggs, one at a time, beating well after each addition. Add the almond and vanilla extracts; beat until smooth. Pour into prepared pan, reserving about 1/3 of the batter. Carefully smooth a thin layer of the raspberry jam over the batter in pan. Top with morsels and 1/2 cup of the sliced almonds. Carefully cover with the remaining batter. Sprinkle batter with remaining 1/4 cup of almonds. BAKE for 1 hour 45 minutes to 2 hours or until wooden pick inserted near center comes out clean. Cool completely in pan on wire rack. Remove side of springform pan.